THE SALE. As part of the sale documents, the seller (you) will make numerous “reps and warranties”. All will be true, as they must be. However, if the buyer is unsuccessful in operating the acquired business, the buyer’s attorney will look at the reps and warranties under a microscope – with “20/20” hindsight. Rest assured, regardless of whether each and every rep and warranty is true, a clever buyer’s attorney can create a question about that accuracy, which can easily turn into litigation for what we call a “post sale price reduction”. Simply stated, the buyer will be aggressively looking to get some of his money back. CASE IN POINT. Many years ago we were consulted by a client who had sold his business. As part of the reps and warranties in the sale documents, the client agreed to a covenant not to compete (which contained a $250,000 liquidated damage penalty for each violation) and the buyer agreed to satisfy specified business obligations of the client. Subsequently, the buyer defaulted by failing to satisfy those obligations, while at the same time a new business opportunity presented itself to our client. Our client sought the advice of the attorney who had represented him in the sale of the business regarding whether he could legally pursue the new venture. The attorney advised our client that undertaking the new business opportunity would be OK, since the buyer had defaulted (otherwise it would have violated the covenant), so our client proceeded to engage in the new business. Almost immediately, the buyer cured the default and sued our client under the liquidated damage provision of the sale agreement. Recall that the provision applied separately to each and every violation. The lower court held that each and every telephone call our client made in pursuit of his new business was a separate violation resulting in a $4,900,000 penalty judgment under the covenant (more than the sale price of the business). Our client then sued his attorney for malpractice since the non-compete covenant remained valid regardless of the buyer’s default. WHAT WE DID. While the litigation with the buyer was pending – before the judgment – we implemented an offshore asset protection trust for our client to protect the remaining sale proceeds. We determined that the malpractice claim our client had against his transactional attorney rendered him solvent, even in view of the potential for a large adverse judgment down the road. MORE. The trial court ruled in favor of the buyer, and the buyer aggressively commenced collection procedures – even to the point of having the sheriff break into our client’s home to seize assets (while they were out of town). As a result of the break-in, the buyer discovered that our client had an offshore trust. Shortly after that discovery, the buyer’s attorney resigned. It is likely that the buyer’s attorney realized that there was no way to get at the sale proceeds which had been bullet-proof protected in our client’s offshore trust. Just think, though, if the proceeds had not been protected, they would have been seized, leaving our client without the funds to pursue and ultimately win the case. CONCLUSION. 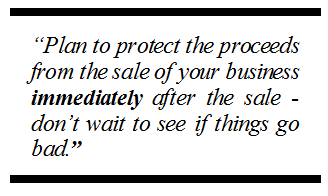 Plan to protect the proceeds from the sale of your business immediately after the sale – don’t wait to see if things go bad. While we were able to help the client discussed in this newsletter, that may not always be possible, and, once you are threatened with or involved in litigation, if we are able to help, your planning options will be significantly narrowed. Take matters into your own hands and protect those proceeds!